Certificates all have there lifetimes fortunately otherwise it will miss it’s goal entirely, so it’s inevitable that we have to rotate some certificates on Azure Stack. I had to rotate the public certificates recently. A public certificate on a multi node Azure Stack POC environment that is of the type Multi SAN Wildcard certificate. Best practice is to have a separate Wildcard certificate for the different roles of Azure Stack but since this is a POC al names are in one certificate. A lot about the Certificate requirements is describe here. Azure Stack expects a certain folder structure for all certificates and some properties on the .PFX file. The test tool will check for this. There is a powershell file on GitHub called CertDirectoryMaker.ps1 that you could use to create the folder structure. Then add your certificates to the right folder. In this case it was simple 1 certificate in all the folders. This was a very interesting session with lots of good info. 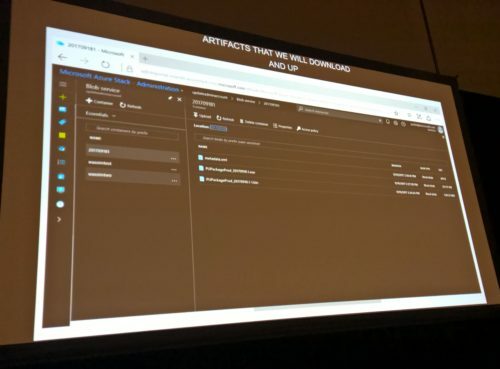 It started of wit VNet integration of Azure Container Service and the ability to give an IP to a single container instead of sharing the IP with several containers. VNet Service endpoints is also new which gives you the ability to deny internet access to VM’s but allow specific Azure services as Endpoint. 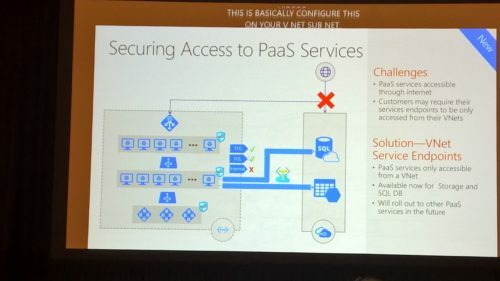 So your VM’s can talk to Azure Services or Paas Services without you trying to figure out behind what IPs the endpoints are located and talking to the rest of the internet. Then NSG’s got a bit less dumber then they were. The applied service tags to NSG’s. So what it means is that you can for example set a tag SQL Servers, or IIS Servers and make all IIS or SQL Servers being tagged by the policy. So you setup one rule with a tag SQL and all your SQL servers wil be bound to that NSG rule instead of creating several rules based on source IP’s of that SQL server. The third day at Ignite was kind a hard to start up, it were long day’s and fun long nights but 2 double espresso kind a pushed me out of my morning dip. Ready to start the day! This sessions was initially not about new stuff. It’s was more to make things more clear about Azure networking. Near the end there was a lot of new stuff about ExpressRoute though! Azure Stack servicing and updating. Updates for Azure stack consist of 2 packages or actually 3, but the third is different and not really clear how that is taking place because it will be the OEM vendor package and all vendors can take care of that in their own way. So the first package is for the OS updates for all the VM’s and hosts in the Azure Stack. The second package is about updating the resource providers in Azure stack. 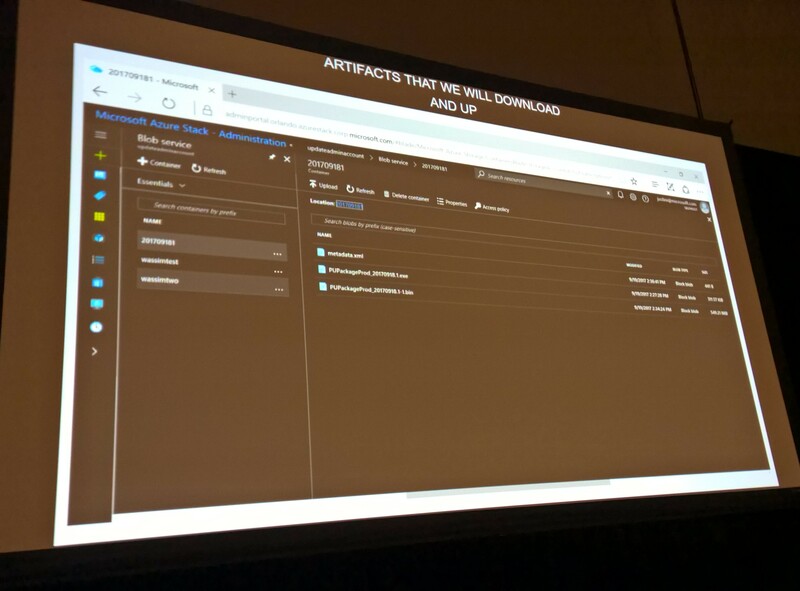 The Azure stack can be updated in a disconnected scenario as long as the bits are downloaded and uploaded in the blob storage through the Admin Portal. Both are pretty big and not yet cumulative. Meaning that you have to run all the updates to get to the latest and you can’t skip an update or something. Updates will be every month and you should not supposed to fall behind more ten 3 months otherwise you will loss support and have to be current first. Since the entire stack is locked you cannot login with RDP and go to Windows Update and click install updates. To take care of that Azure Stack has an Update Resource Provider. The resource provider gives an wizard in a set of blades to provide a destination to the update packages and install the update or schedule it. Today was the first day of Ignite 2017 which was about to kick off with a key note from Satya Nadella. Unfortunately it was a lot of the same slides and info as from Inspire 2017, so it was a bit of a waste of time, and since we had a lot of drinks at some very nice places in Orlando and a sprinkler fight with some InSpark colleague’s the night before it would have been nice to get a couple of more hours of sleep 😉 . With Azure Change Tracking in the OMS suite you can track changes in a VM through Log Analytics on a big nummer of resource. For example on File level, Registry, process and service level. Here to a slick displayed dashboard to get a good overview of what happend. Hi All, recently I encountered some issue’s with third party software to replicate VMs from an old Windows Server 2012 cluster to a brand new Windows Server 2016 S2D Cluster, were it turned out that the third party software was not fully supported on Windows Server 2016 although they claimed to be. I know you could use Share Nothing live Migration but in this case that was not possible so we had to look for third party software. In this example I encountered two issue’s when using Storage Spaces Direct and the ReFS file system (which is a hard requirment with S2D) together with the replication software. So my first issue was with the agent that you install on a Windows Server 2016 Hyper-V host to be able to migrate servers from a source VM to a Hyper-V Storage Space Direct cluster as destination. After a push from the console or a manual installation the agent service would not start. After starting it crashes with a .net error. Well that seems pretty simpel and straight forward… do you really need a blog for that. That’s true but the next issue is not directly noticeable. In the end it turned out that the service could not start because it could not work with ReFS. After starting of the service failed, the vendors tech support provided a work arround, and since there was a deadline pushing we took the work around and left the agent running and migrated the VMs through the work around but that’s not what this blog is about.